Note: Specific elements of the Kulachara Tantra Marga practiced at the Kamakhya Temples’ Complex located on the Nilachala Hills are not disclosed to the public, thus only a general overview is given below. Kamakhya Temples’ Complex is widely recognized as the birthplace of Shakta Tantrism, as well as the most powerful seat of the goddess in India. Critical to that identity is the unique Tantric tradition that has developed over many centuries under the primary care of the Sebaits of Kamakhya Temples’ Complex. Under their care, the tradition has been maintained for many hundreds of years, and the tolerant and secular social values that characterize the socio-religious culture of the Kamakhya Temples’ Complex and its Sebaits, inspired and informed by the practice and philosophy of the Tantric tradition, have flourished. 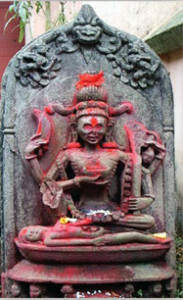 The Kulacara Tantra Marga of Kamakhya has evolved and taken shape as a unique Shakta Tantrika Tradition and is the only surviving Tantra Magra in the world in its purest form. The Kulacara Tantra Marga of Kamakhya which is also called as Yogini Kaula is a complex mixture of Hindu, Buddhists and contribution of practitioners of various streams of Tantrism influenced by indigenous Tibeto-Mongoloid, Austro-Asiatic, Tibeto-Burman, Chino-Tibetian, Dravidian elements for well over a thousand years. The teachings, rituals and techniques of the Kulacara Tantra Marga of Kamakhya have been very carefully kept as guarded secret by the initiates till date. The tradition runs through the system of Guru-Shishya Parampara (teacher-student tradition) and most of the knowledge and technique is passed down orally to an initiate by his/her Guru (teacher). The women are an inseparable part of the Kulacara Tantra Marga and holds higher position than their male counterparts and respected as the form of Shakti (Devi). The women play the most significant part and takes leading role in the rituals performed according to the teaching and techniques of Kulacara Tantra Marga. The puja / rituals of the Kulacara Tantra Marga are performed very secretly and non-initiates (from Kamakhya also) are not allowed to participate. The Raja-Rajeswari Puja performed during Chaitra Navaratra (Spring Navaratra) for 15 days is the main / principal puja / ritual of the initiates of Kulacara Tantra Marga of Kamakhya Temples’ Complex. In the rituals performed during Chaitra Navaratra (Spring Navaratra) all the initiates of Kamakhya Temples’ Complex participate. The puja / rituals are performed behind closed doors and outsiders and even resident sebaits of Kamakhya Temples’ Complex who have not been initiated according to the rule and system of the Kulacara Tantra Marga are not allowed to participate in these rituals. More interestingly, in the Kulacara Tantra Marga there is no discrimination of caste or gender. Any person belonging to any caste and gender can receive initiation from his/her Guru and after going through the process of initiation all caste gets merged into a single stream called initiates (Sadhaka). Every initiate irrespective of their caste and gender gets the right to participate in the rituals taught by the Guru. Moreover in all the puja / rituals / festivals in the Kamakhya Group of Temples are performed or observed according to the systems prescribed of Kulacara Tantra Marga.